Games, centers, pocketcharts and more for a farm theme! 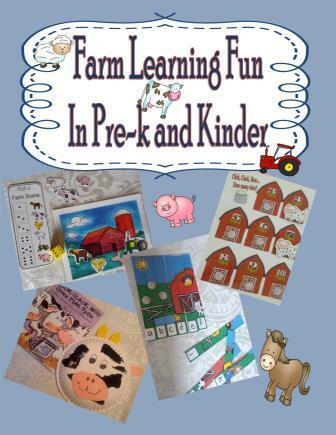 Hands-on Activities for a Preschool or Kindergarten Farm Themed Unit. Craft templates, pocket chart manipulatives, math and literacy centers, games, and more to create a hands-on Farm unit you can use for years with your students. Over 75 pages in this pdf document!!! Below is a detailed list of the items found in this set. Please see the preview for more pictures and details. Page 4— How Many on the Farm Worksheet. Students look at a farm picture and count how many they see of each given animal. Terms most and least are also used.. Page 5 to 12—Counting Center. Print, laminate, and cut. Provide clothes pins. Student counts and marks how many with the clothespin. Page 13 to 15—Patterning Activities. Velcro center and a cut and paste worksheet. Pages 16 to 18—Graphing Fun Activity. Page 17 should be printed and displayed. Students look at page 17 to answer and fill in page 18. Pages 19 to 23—Farm Puzzle Fun. Four farm themed puzzles that I suggest you print, laminate, and cut. One is counting by 1’s. Another is counting by 5’s. The third is a blank one that you can fill in with any skill (ABC’s, count by 10’s, count by 2’s…) The fourth is a matching puzzle. Page 24 –30—Beginning sound fun. Various activities for class instruction and individual practice. Page 31 to 33—Animal Friends—A little cut and trace book. Students trace the words and numbers. They color and then cut out a smaller animal to glue on the hill in the background of the bigger animals box. Page 34 to 35—Fun with farm play-dough mats. Page 36 to 37—A cow themed craft with templates that goes along well with the story Click Clack Moo. Page 38 to 41—Guess the animal in the barn manipulatives to use during class instruction. Page 42 to 47—Counting dots on cows and matching them to the correct number. Small center and larger class demonstration size. Page 48 to 51—Five Black Cows Class Interactive Chart Pieces. Everything you need to make an interactive display to go along with a fun counting poem. Page 52 to 54—PIG CRAFT—Templates to create a pig using a balloon. Page 56 to 60—A pig themed finger play written by C. Gallagher. Includes graphics to create a interactive chart to use with the finger play! Page 61 to 63— Five pigs interactive book for students to make. Coloring and tracing involved. Great activity to use after using the chart on 56 to 60. Page 64 to 66— Roll a Farm Scene Game—All materials need to make game. Just supply dice. Page 67 to 70—T is for Tractor and Turkey Craft. Includes patterns and a fun idea for a creative craft using the students picture. Page 73 –76—A fun counting game played in small groups. Everything you need to play the game is included.